We are thrilled to announce that Turbulence.org will stay online for the foreseeable future. Thanks to the Electronic Literature Organization (ELO), the Turbulence.org Archive (http://turbulence.org and http://archive.turbulence.org) will be supported and hosted by the ELO (financial) and the Electronic Textual Cultures Lab (ETCL) at the University of Victoria, Canada (servers). We want to thank the ELO’s Board, especially its President, Dene Grigar (assisted by Shawn DeWolfe), whose swift action and unwavering support brought us to this new ‘lifesaving’ partnership. Dene is Professor and Director of The Creative Media & Digital Culture Program at Washington State University Vancouver, whose research focuses on the creation, curation, preservation, and criticism of Electronic Literature. Also, our deepest gratitude to Ray Siemens at ETCL. Turbulence.org is also archived online at NETescopio and Archive.org; and offline at The Rose Goldsen Archive of New Media Art (scroll down for details). In February 2019, Turbulence.org was accepted into the WebArchive of the United States Library of Congress. A partnership was established with Gustavo Romano, Curator of NETescopio for Extremadura and Iberoamerican Museum of Contemporary Art (MEIAC) Badajoz, Spain. The entire Turbulence.org Archive is now available here. Additionally, a museum exhibition – RAM Memory – Turbulence: Presentación del archivo digital – was on from February 26 to April 25, 2018. Romano curated an abbreviated version of RAM Memory for The New Art Fest’18 at Museu Nacional De Art Contemporãnea Do Chiado, Lisbon, Portugal. A new project of the MEIAC, NETescopio, consists of an on-line archive in continual development dedicated to the conservation of works of art generated for the web. Its primary objectives are to protect, distribute and catalog the above mentioned works, using the Internet medium itself to achieve these ends, thus enabling it to grow and be updated on an ongoing basis. In 2015, prior to the redesign of Turbulence.org and the launch of its final commissions, Archive.org (aka The Wayback Machine) migrated all of the contents of Turbulence.org’s server – Commissions, Artists’ Studios, Guest Curated Exhibitions, Spotlights; and the Networked_Performance, Networked_Music_Review, and Upgrade! Boston blogs – onto their own servers. In time, we hope they’ll make the entire archive available to the public. In the past, one hundred and forty commissioned works have been sent on hard drives to the The Rose Goldsen Archive of New Media Art (Cornell University, Ithaca, New York, USA), where they will be presented in off-line exhibits. In addition, the contents of our server were migrated to Archive.org servers. NRPA’s partnership with the Goldsen Archive permits both organizations to explore innovative methods of presenting artistic projects built on challenging or obsolete platforms; new ways of engaging the public via the Goldsen Archive’s international seminars; and broadening access to Net Art via the Goldsen’s regional partnerships with, for instance, Hallwalls (Buffalo). The Archive is available to the public for consultation and access in the Carl A. Kroch Library. Users are free to consult materials on computer workstations and study tables during reading room hours. The Goldsen Archive also makes presentations available for classes or large groups. Do You Want to Help Us Preserve Turbulence.org? Here’s why you ought to: Turbulence.org is the oldest, largest and most consistent commissioning Net | Web | Hybrid Art site in the world. A sub-category of New Media Art, its over 230 works span a crucial 20-year period of exploration and innovation in digital networked environments, ranging from hypertext to data visualization, blogs to social networks, interactive dance and musical compositions to 3-D architecture and iPhone apps. It contains works that reflect the technological environments of their time, such as Marianne Petit’s The Grimm Tale (1996), which Andrew Leonard (Wired Magazine) termed “jerk-stop art – a stuttering, jittery, clunky mode of expression rising up in response to the low-bandwidth, high latency limitations of the Web as a medium”; and others that opened new pathways in Net Art’s trajectory, such as Grafik Dynamo (2005) – “which experiments with social media, dynamic systems, and storytelling in a way that challenges our general assumptions about narrativity” (Dene Grigar, Leonardo). 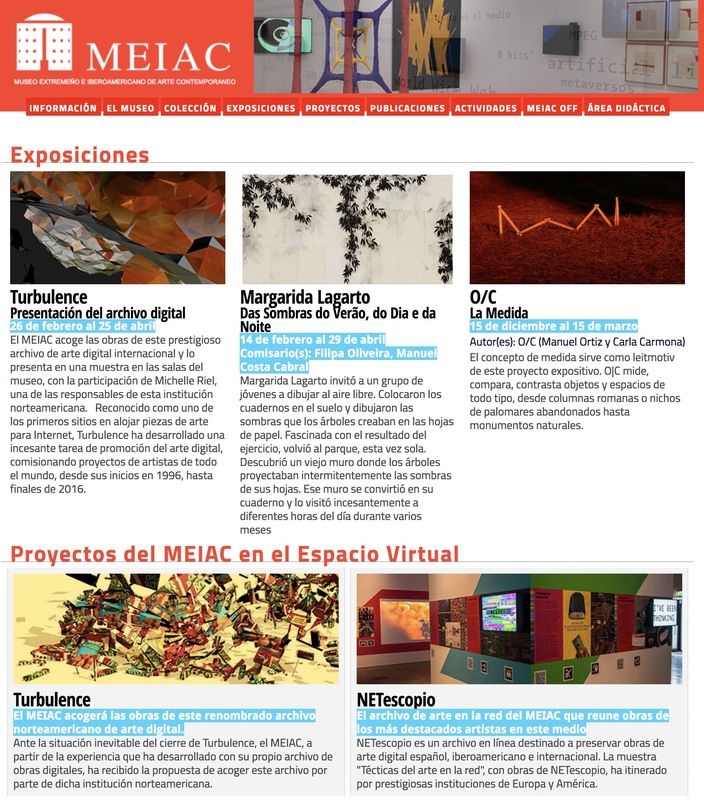 Many Turbulence.org works have won prestigious awards and been included in exhibitions worldwide. Apartment (2001) by Marek Walczak and Martin Wattenberg, which constructs apartments based on semantic analyses of participants’ words, was one of the first Net Art works to be included in a museum exhibit, Data Dynamics at the 2002 Whitney Biennial. Golan Levin’s The Secret Lives of Numbers (2002) – an early Google Search and Data Visualization work – was awarded the Prix Ars Electronica Net Vision Award of Distinction (2003), and exhibited in the 2004 Whitney Biennial. Cory Arcangel’s Data Diaries (2003) – where Arcangel tricked Quicktime into thinking that the RAM of his computer was a video file – exploded onto the Net Art scene: a work created, essentially, by the computer “that leaves Cory playing in the rec room with his Pixelvision camcorder – all dirt-style, geekcore, and what we like.” (Alex Galloway) These works and many others are cited by Net Art scholars and taught widely. Currently, Turbulence.org is freely accessible to the online public. While the majority of its works have survived the rapid technological advancements, a number are not experienced in the way they were intended. For instance, the increase in screen resolution (800 X 600 to 1280 X 800 and higher) presents today’s viewer of Grimm Tale with a very different aesthetic than the 1996 version. Data Diaries ‘plays’ much faster than it did originally. A few Turbulence.org works no longer “play” at all. Preserving artworks that depend on specific technologies is a challenge: with Net Art, there is “a crisis of collection – and hence cultural memory” (Steve Dietz) partly because until quite recently few museums have collected the work , but even more because of the nature of Net Art itself. Without some means of safeguarding the future of these works from technological obsolescence, there will be no record of this innovative ‘moment’ in art history. Researchers from DOCAM (Documentation and Conservation of the Media Arts Heritage) and the Variable Media Network agree that new media preservation is a spectrum of activities with no one solution ever entirely adequate. The following strategies have been discussed and attempted: Storage (collecting the software and hardware necessary to run the works); Emulation (recreating software, hardware and operating systems through emulators or programs that simulate the original environment and its conditions); Migration (transferring and upgrading the work from older formats and/or media to newer formats and/or media); and Reinterpretation (reconfiguring or re-performing a work in a contemporary context and environment without abandoning the integrity of its original identity). To-date, NRPA has only had the resources to migrate the works to another server and to external hard drives. Its Artist Questionnaire – which requests highly detailed information about both the conceptual and technological framework of each piece, and an analysis of the work’s current environment compared with that of the original environment – allows for future reinterpretation and/or emulation.